But, how do we justify (not “prove”, not “explain”, just “justify”!) this belief? Any YouTube viewer can come up with a million apparently valid negations. Nothing changes! Molecules are the same! He died 2000 years ago! Well, let’s see if this idea of bread and wine becoming Body and Blood, and Soul and Divinity, of Jesus contradicts or is in agreement with the big picture of the Church’s teaching. If we find a contradiction, Dawkins is correct. If we find agreement… we have proven nothing, except that Catholics are coherent in their crazy logic. Jesus of Nazareth, born approx. 2/3 BC (If it sounds funny to you that Christ was born in the year 2 Before Christ… ask Jimmy Akin about it), executed approx. AD 30, is God. More precisely, he is the second person of the Trinity, true God and true man. Then, of these two possible outcomes, which is the most logical? Those infinitely loved children of God who happened to not live in Palestine in the years 2/3BC-AD30 just missed out, and there’s nothing God can do about it (contradicts hypothesis 1) or wants to do about it (contradicts hypothesis 2). God, in his infinite wisdom and power figures out an amazing way to be with his children ALWAYS and ANYTIME! To me, 2 makes more sense. Hence, the Eucharist. Then, let’s tackle some simple objections. “But he died 2000 years ago!” – Yes. And rose. Taking the teaching in its entirety, Jesus rose, but not as a ghost, he rose with his body. Boom. We call it the glorified body. What’s it like? No idea, but judging from historical accounts when you have a glorified body you can: go through walls (Jn 20:19), disguise as a stranger (Lk 24:13), levitate upwards like Neo leaving your buddies perplexed like many Agent Smiths (Lk 24:31, Acts 1:6), and eat fish (Lk 24:42). What if you don’t like fish? You probably have glorified taste buds that can change that. Likely, the glorified body does not age! “But that would be cannibalism!” – Nope, cannibalism is eating a dead corpse. Christ is alive in his glorified body. “But that’s impossible!” – Is it? Consider this – what happens when you eat? You intake organic matter, this gets broken down in processes described in chemistry, and, after discarding the garbage, you retain nutrients (useful molecules) and energy (stored in molecules such as ATP). Some of those nutrients then go and build some parts of your body: bones, muscle, fat (plenty of that). Guess what, they stay there for a long time! Is your biceps a part of your body? Well, it once was a chunk of another animal, likely a cow! Is your belly flab part of your body? Of course not! That’s just a temporary guest. Forget chemistry, and pretend you’re a particle physicist. You put a couple million protons, neutrons, and electrons in your mouth, in the form of a chicken nugget. Give it some time, some of those protons, neutrons, and electrons become part of your mouth! Seriously, we turn bread and wine in our bodies all the time! And I’m Italian, so I probably do it more than most of you. Why would we be surprised if the Almighty does it on a larger scale? “But nothing changes!” – No chemical or physical reactions, to be precise. But back to the elementary particle example above, nothing happens to the neutrons you ingest in that cappuccino. Seriously, they are exactly the same, yet they become your body. “But the Church invented that later!” – Nope, study your history. It was exceedingly clear to the first Christians that the Eucharist was not a symbol. Here is a collection from a dozen scripts of the first centuries which confirm it. Of course this rambling is no proof – it’s just me saying: I can’t believe that I actually believe it, but I do. 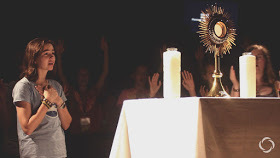 This entry was posted in RC Live and tagged Eucharist. Bookmark the permalink.